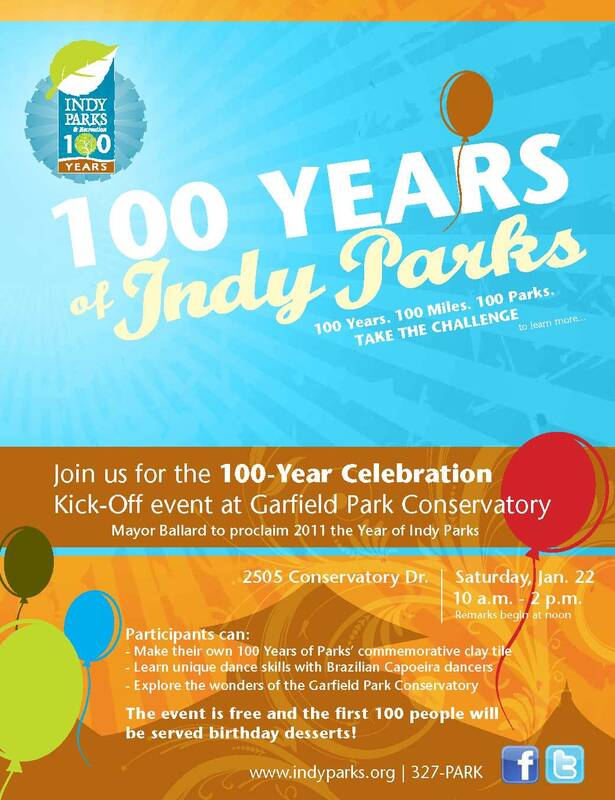 Join the kick-off for the 100 Years of Indy Parks’ year-long celebration at Garfield Park Conservatory. INDIANAPOLIS (January 14, 2011) — Indy Parks and Recreation announces the celebration of 100 Years of Indy Parks in 2011, highlighting the rich history and grand vision of the Kessler Park and Boulevard System, which laid the foundation for the City’s development of a premiere park system. The yearlong celebration promises adventurous challenges, exciting events and special programs to mark the significant achievement. The 100 Years of Indy Parks Kickoff on Saturday, Jan. 22, from 10 a.m. to 2 p.m. at The Garfield Park Conservatory will give kids of all ages an opportunity to learn more about unique programs Indy Parks will launch throughout the year, including a challenge to visit 100 significant landmarks in the Indy Parks system; Geocaching, –a high-tech scavenger hunt across the entire county; and an opportunity for everyone to share stories, memories and photos from Indy Parks through the years. Participants can make their own 100 Years of Parks’ commemorative clay tile, learn unique dance skills with Brazilian Capoeira dancers and of course, explore the wonders of the Garfield Park Conservatory. The January 22 event is free, and the first 100 people will be served birthday deserts!